A major milestone has been reached for East West Rail as contracts have been awarded for the rail link through Bedfordshire, Buckinghamshire and Oxfordshire. A rail link connecting Oxford with Cambridge and Ipswich has moved a step closer to reality with Network Rail’s appointment of partners to deliver the next phase of the East West Rail scheme. This comes six weeks after passenger trains began running from Oxford Parkway, a new station, on a reopened line to Bicester and down the London Marylebone – the first new rail link of a major city to the capital in more than one hundred years. This is East West Rail Phase 1. An alliance of four equal parts between Network Rail, Atkins, Laing O’Rourke and VolkerRail will build East West Rail Phase 2 (EWR2) – linking Oxford, Milton Keynes and Bedford, and Milton Keynes with London Marylebone via Aylesbury. The EWR2 alliance is currently working on the outline design and construction programme for the scheme. Once this initial segment of work is complete, the EWR2 alliance will consult with the Department for Transport to agree a final design, construction timetable and costs. It aims to submit an application for a Transport & Works Act order in autumn 2016. 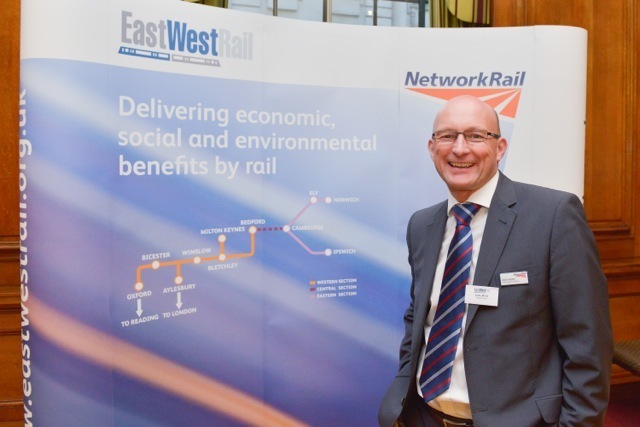 Andy Milne, Network Rail’s senior programme manager and alliance manager, said: “The railway is vital to Britain’s economic health. We are carrying out this Railway Upgrade Plan scheme because we care about giving train passengers what they want and about building a strong economic future for people in the regions East West Rail will connect. The long-term aspiration of East West Rail is to extend the line to Cambridge, for services to run through to Ipswich and Norwich in the east, via Milton Keynes, Bedford and Cambridge. This is a key missing piece in this country’s rail network that will enable train customers to make more direct journeys and avoid travelling through London. Graeme Castle, rail sector leader for Laing O’Rourke, speaking on behalf of all the EWR2 partners, said: “We are all proud to be involved in this nationally significant project and aim to build on the success of the Staffordshire Alliance, where the partnership is working collaboratively to deliver the Stafford Area Improvements Programme. The East West Rail scheme involves upgrading and reconstructing underused and mothballed sections of the railway linking the Great Western, Chiltern, West Coast and Midland main lines north of London and providing a strategic east-west route connecting key towns and cities. It will deliver significant economic, social and environmental benefits to Oxfordshire, Buckinghamshire and Bedfordshire. • VolkerRail is a leading multi-disciplinary railway infrastructure contractor. Atkins: Atkins is one of the world’s leading design, engineering and project management consultancies, employing some 18,000 people across the UK, North America, Middle East, Asia Pacific and Europe. Our people’s breadth and depth of expertise and drive to ask why has allowed us to plan, design and enable some of the world’s most complex and time critical projects. Laing O’Rourke: With a heritage spanning over 150 years, Laing O’Rourke is an internationally-focused engineering enterprise with world-class capabilities. We operate an integrated business model comprising the full range of engineering, construction and asset management services delivering single-source solutions for some of the world’s most prestigious public and private organisations. Committed to a sustainable future, Laing O’Rourke is re-thinking the way the built environment is designed, delivered and operates – collaborating with world-leading industry and academic partners, bringing innovative new solutions, ensuring the most efficient long-term engineering solutions. VolkerRail: VolkerRail provides a wide range of contracting services to the railway industry from major capital projects to track renewals and specialised operations including signalling, welding, on-track plant and machinery and overhead power supply. The history of the company traces back to 1935 but the modern day VolkerRail formed as GrantRail in 1996 before rebranding under the VolkerWessels UK umbrella in 2009. VolkerRail is part of VolkerWessels UK, a multi-disciplinary construction and civil engineering group with a turnover of c£747 million. VolkerWessels UK employs more than 2,400 staff in six operating companies. The group is the UK arm of Dutch based VolkerWessels; one of the largest construction groups in Europe.